Welcome to Chelsea Rare Coins! 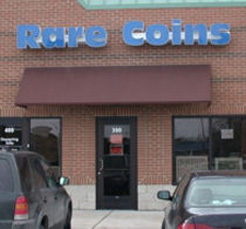 Located just outside of Ann Arbor, Michigan, Chelsea Rare Coins offers the collector, investor and dealer an excellent platform for buying and selling rare coins, currency, gold, silver, and bullion. outbid any coin dealer in Michigan! Chelsea Rare Coins is the largest buyer of scrap gold and silver in the midwest. We will match and beat anyone's price easily. CRC is the largest buyer of Franklin Mint in the USA. CRC buys all collections and estates - currency, gold, silver, platinum palladium, stamps, and more. CRC is one of the few Rare Coin Dealerships licensed to trade on both Coinnet and the Certified Rare Coin Exchange (CCE). CRC is in the unique position of offering a very attractive buy/sell/trade market on virtually all US coins as well as scarce Large Size currency and most bullion items. Silver Dollars are a specialty, as well as US Gold. An excellent selection of Large Size Currency is also well-represented. With attendance at virtually all Major Numismatic conventions, CRC purchases millions of dollars worth of rare coins annually. Chelsea Rare Coins is an Ebay power seller, with our own Ebay store. Check it out and see hundreds of excellent deals on rare coins, currency, and other offerings. We have thousands of satisfied mail order numismatic customers. As the largest advertiser in Coinage (America's most widely read rare coin magazine), we will pay TOP DOLLAR for all quality numismatic material — Colonials thru $50 Gold. Whether it is a small bullion purchase or the liquidation of a large estate, CRC is at the forefront of rare coin buyers in the US. With seven figure capitalization, CRC can purchase ANY deal outright. Conveniently located 12 minutes from Ann Arbor, Michigan off I-94 (Exit 159). Ample parking is always available and most customers find themselves parked literally 4 feet from our front door making the transport of heavy items rather simple. Our bank, TCF, is located across the street. Many customers opt to cash their check on the spot. Whatever your goal is CRC will make any transaction enjoyable and profitable. Contact us today: (734) 433 9900 or (800) 666 0348.